Herbal remedies have been used for thousands of years by many civilizations to treat everything from the common cold to high blood pressure. One of the easiest ways for modern society to make use of these natural remedies is through the consumption of herbal teas. The following herbal teas are some of the most beneficial in regard to treating common medical ailments. Chamomile tea isn’t just great for unwinding after a long day. Although one of the most popular herbal remedies for anxiety treatment, German chamomile tea has recently been approved in Germany for the reduction of skin swelling, to fight bacteria and to treat stomach cramping. 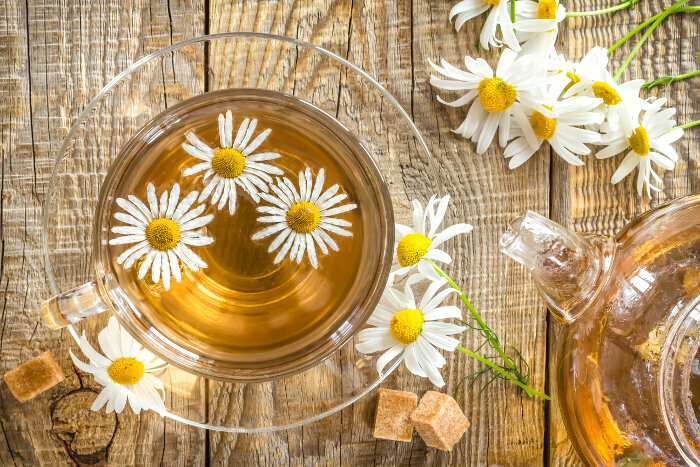 However, there are many other medicinal uses for chamomile tea including the treatment of abscesses, inflammation of the gums, chest colds, wounds that are not healing correctly and many types of irritating skin conditions. Historically, for skin conditions like eczema, chicken pox and diaper rash, a tincture or bath containing chamomile has been used. However, applying a wet tea bag to the skin can also provide relief. Chamomile is also used to provide relief from menstrual pain and bloating, as well as providing a calming effect for anxiety. The stem of the ginger plant or rhizome is used for many health and healing purposes. Containing highly effective phenol compounds and ingredients found in pharmaceutical laxatives, ginger tea is commonly used for upset stomach, nausea (including nausea from chemotherapy and surgery), colic, motion sickness and diarrhea. Also used as a daily detox, ginger tea is generally thought of as safe for long-term use. Other uses include pain relief from muscle aches or arthritis, as well as upper respiratory tract infections. Ginger is also commonly used for the treatment of bronchitis, chest pain and lower back pain As ginger has stimulant properties it can also cause a decrease in appetite for weight loss and slimming. People who use anticoagulants should not drink ginger tea, as it interacts with this type of medication. Milk thistle contains silymarin, a known antioxidant and anti-inflammatory component. When consumed as a tea, milk thistle is thought to be helpful at lowering LDL cholesterol levels, thereby benefiting the heart. Additionally, milk thistle is most well known for treating liver problems such as jaundice, cirrhosis and hepatitis. As of 2015, current research shows that milk thistle when combined with traditional treatment can help people with diabetes control symptoms, as the plant improves insulin resistance, according to WebMD. Milk thistle is most commonly known as a liver detox tea, thereby promoting overall health. The dried flowers of the lavender plant are used to make a fragrant tea, beneficial for depression treatment, insomnia, vomiting, nausea and flatulence. 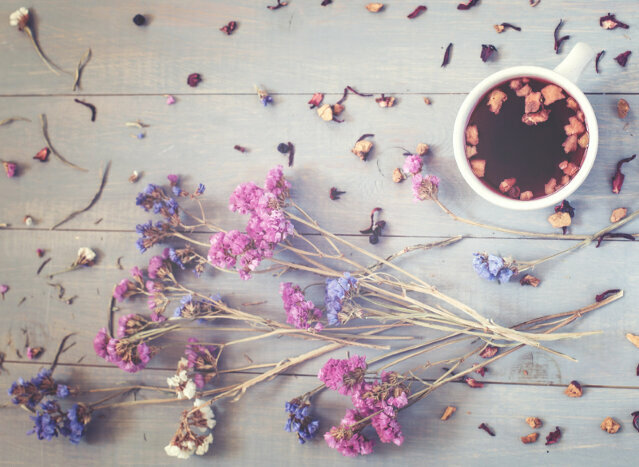 Additional uses for lavender tea include improving appetite, promoting menstruation and treating acne. A wet tea bag may be placed directly on acne, if desired. Rubbing a wet tea bag on the skin also repels mosquitos and may help treat hair loss. Some people also use lavender tea for cancer, toothaches, nerve pain such as peripheral neuropathy and migraine headaches. People who use sedatives, CNS depressants or chloral hydrate (for insomnia or surgery) should not use lavender tea, as it increases the effects of this type of medication. Rhubarb root tea may be difficult to find in the market, but it can be made by mixing rhubarb root powder with hot water. This is a common treatment for constipation in Traditional Chinese Medicine or TCM, as it stimulates the colon. This classic Chinese tea can be used on the skin for cold sores, for stomach pain and heartburn. Research also suggests that using rhubarb in people who have kidney failure can improve kidney function, reduce the side effects associated with gonorrhea and improve weight loss among people who are obese. Herbal teas generally provide a natural and safe alternative to many types of pharmaceutical medications or treatments, as many medications actually use components from the plants used to make various types of teas.